The Albion String Quartet is a relatively new ensemble. Formed this year, it features violinist Tamsin Waley-Cohen with Emma Parker (violin), Rosalind Ventris (viola), and Nathaniel Boyd (cello). There are a number of opportunities to hear the ensemble in London next year, but they have a special Christmas gig at the Tricycle Theatre, Kilburn on Sunday 18 December 2016. The four young players share a belief in the communicative power of the string quartet, and play a fine group of instruments between them - Stradivarius, Amati, Guarnerius and Grancino. 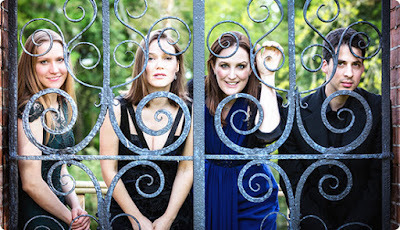 Their programme at the Tricyle Theatre will feature two seminal quartets, Haydn's Quartet in C major opus 20, no.2 and Schubert’s Quartet no 14 in D Minor ‘Death and the Maiden’, as well as a Christmas surprise. See the Tricycle Theatre website for full details.